"To Day Is A Good Day To Die!" until he was ordered by the High Council to transfer to the USS Cairns in a Federation/Klingon Officer exchange. 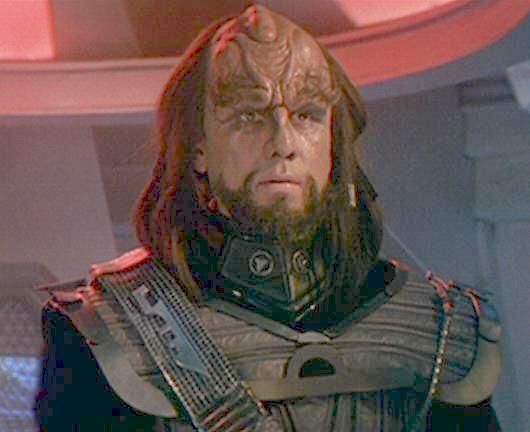 DoTagh was raised hearing constantly of the heroes who came from his family as all Klingon Children are. He excelled in his combat exercises all through his youth recieving the title of Master with a Bat'leth and a Mek'leth. On his first birthday he was given his first D'ak'tagh, and on his fourth his uncle took him hunting for Kolar Beast. He was given a traditional Klingon upbringing and his abilities grew because of this, his sense of honor, some said, was equal to that of his father the Great Kolath. On his fifteenth year, DoTagh ventured out alone, on a quest to prove himself to his father and his House and bring back the largest Kolar Beast he could, killed with his bare hands. He was missing for nearly two weeks, all searches had nearly been called off when DoTagh, bloodied and with broken bones returned dragging a 280lb Kolar Beast behind him, his Mek'leth jutting out of the animal's side. His younger cousins sang songs of his honor in combat against the Kolar Beast, and his house honored him with a dinner to commemorate the great victory. The next year he was off to the Klingon Defense Forces and his duty to serve the Klingon Empire with honor and distinction. The House of Koloth is a very famous house, taken over and renamed by the great Klingon Da'har Master Koloth who fought alongside the great warriors such as Kang and Kor and swore a blood oath with the two and with a Trill Diplomat named Curzon Dax to destroy an Albino who had comitted attrocities against the three houses. DoTagh's self-imposed mission in life is to become a Da'har Master like his father, and to defend the Empire againstany and all threats that may come to it, and to die with honor, as a warrior. victory song after a battle and the first to enjoy a good drunken brawl over some Bloodwine. As far as Klingon Warriors go, DoTagh is as sane as they come. He thirsts for battle, but can be diplomatic until he feels that his honor has been challenged then he is quite likely to fight to the death over the infraction. He keeps his father's Bat'leth (brought to him by his father's comerade and fellow Da'har Master Kor after his father fell in combat against the Albino) in his quarters enshrined in a position of honor as a constant reminder of how far he has yet to go to follow in the footsteps of his father. continue to wear his KDF uniform and D'ak'tagh. DoTagh's major short fuse is someone cutting off his Klingon Opera while he relaxes after duty, such a thing could get someone killed.